Our document management system allows companies to manage all the corporate information in a simple, centralized and controlled manner. Thanks to this solution, all the documentation is globally accessible to all employees in a secure and personalized way, from any place and device. 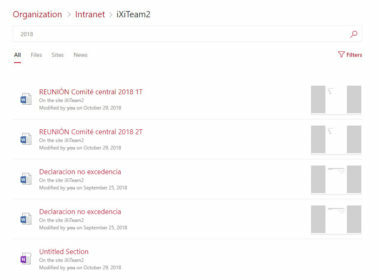 The document management system that we implemented in IXIT is based on SharePoint Online and OneDrive for Business, tools from the Microsoft cloud: Office 365. To guarantee a controlled access to the documentation, on each site, library and folder of the document management system are defined the groups of users that can read and / or modify the documents. Thus, certain users can modify the documentation relating to their department while they can only read the information of other departments and do not have access to the confidential information of any department. It is also possible to share documents with external users by sending secured links with limited duration. 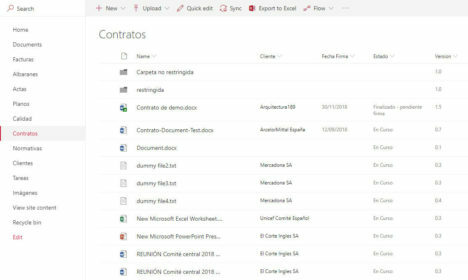 Thanks to OneDrive, users can synchronize document libraries with local folders on their computers, allowing work in offline mode. It is also useful for users who are reluctant to change, they can continue working on their local computers, without directly accessing the document management system that has its own interface. The documentation system structure is designed based on the specifics requirements of each company. It is usually organized by office and / or department, but it can also have a special structure organized in a way that specifically fits the needs of each company. The use of customizable metadata allows a better organization of the documentation and make its search easier. For instance, in the repository where the invoices are kept, it can be useful to add the fields Number, Date, Amount and Client. In the fixed assets library it may be useful to add the fields: Price, Purchase year and Asset type. The views allow sorting, grouping and filtering of the documents in the library. The document manager includes version control engine that saves all the changes made to the documents. Users can see who has modified what, and when. Advanced users can also recover old versions of documents. The documentation system allows the shared and simultaneous edition of Office documents (Word, Excel, PowerPoint and OneNote). When a user modifies a document, he sees the other users who are currently editing it, and the part of the document being modified is highlighted. It is also possible to block a document, preventing anyone from modifying it until its lock is released. You can define alerts to notify a user as soon as a document is modified. With custom workflows, a higher level of control of the documentation can be achieved, allowing for example to make a document only visible to all users once it has been approved. The document management systems that we implement in IXIT are customizable and respond to the precise needs of each company, regardless of their characteristics. Do not hesitate to contact us for more information.